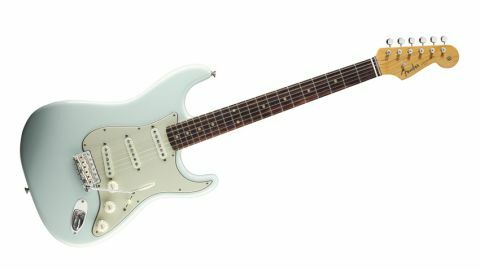 Outside of tracking down a good vintage example or visiting the Custom Shop, this guitar is the most authentic vintage-style Stratocaster available on the planet, bar none. The old vintage sound vs playability compromise. Yet just as He Of High Trousers can spot the spark that elevates the exceptional from the mediocre, so it's obvious to any serious Strat fan that the new range of American Vintage models elevates things yet again. Here we examine the '59. Case open, olfactory and visual senses in overdrive, exactly what do we have here? Solace for the afflicted comes first here in the to-die-for curves and radii of the '59 body - a fine example of How It Should Be for the most elegant and ergonomic guitar design of all time. Meanwhile, if the Faded Sonic Blue finish doesn't make your heart skip a beat, well, then you're probably one of the people at the top of the previous paragraph. The new all-nitrocellulose 'Flash Coat' lacquer from Fender is a significant step on from some nitro finishes of recent times. It still feels like lacquer, that is to say 'stickier' than modern polyurethane or polyester, but not over-soft like a lot of new Gibsons. Thankfully as far as we're concerned, Fender has completely reshaped the neck to better reflect the original guitar. The '59's neck is slimmer (21mm at the 1st fret, 24.4mm at the 12th) and more D in shape, altogether more 'modern' feeling than the V. We really do like the taper on it, too - the increase in thickness as you go up the neck really adds to the authentic feel. The fingerboard edges are beautifully 'rolled'. Plenty of manufacturers do this as it simulates years of playing up and down the neck by gently sanding off the edges. If you're a fan of old guitars, it's hard to see how you wouldn't prefer this to a new square-edged 'board, and the '59 has a flat-bottomed rosewood slab. It might seem like yet another tiny detail, but this guitar has a proper bone nut, too. In our opinion, all these details add up visually and tonally. For instance, The first three-ply pickguards at the end of the 1950s used a nitrate material where the middle, black layer bled into the white layers somewhat, giving a greyish green tinge. The '59 has a modern remake of this, with the rare 10-hole format, but it doesn't look much like an original as we know them now (probably because they're all 50-plus years old!). In any case, it all looks right here, from edge bevels and screw types, to sizes and positions. It also has a full metal shielding plate beneath the guard. Fender has played it straight down the vintage line with the bridge, all the way down to newly tooled saddles complete with 'PAT.PEND.' stamps. Similarly, the team has taken it to the nth degree with pickups, too, by finding and analysing originals to recreate them anew and the '59 uses Alnico V magnets with Heavy Formvar wire. Even the tone caps are new and period correct, with authentic-looking 'ZNW1P1' 0.1 microfarad 'brown phonebook' caps. "Relative to the other new Strats in the range, like the American Vintage '56, the '59 is sweeter sounding overall, and has a little more presence with cleaner sounds"
Relative to the other new Strats in the range, like the American Vintage '56, the '59 is sweeter sounding overall, and has a little more presence with cleaner sounds. It's more 'Stratty' in the in-between sounds, too, which is to say with a more noticeable dip in the mids for that hollow sound. We're splitting hairs, though, because the fact is you could play anything from The Shadows, through The Beatles, Hendrix, David Gilmour, SRV and plenty more besides on any one of these guitars.